Ascidians (tunicates; sea squirts) are marine animals which provide a source of diverse, bioactive natural products, and a model for toxicity screenings. Compounds isolated from ascidians comprise an approved anti-tumor drug and many others are potent drug leads. Furthermore, the use of invertebrate embryos for toxicological screening tests or analysis offers the possibility to image a large number of samples for high throughput screens. Ascidians are members of a sister clade to the vertebrates and make a vertebrate-like tadpole larva composed of less than 3000 cells in 18 hours. The neural complex of the ascidian larva is made of only 350 cells (of which 100 are neurons) and functional genomic studies have now uncovered numerous GRNs underpinning neural specification and differentiation. Numerous studies showed that brain formation in ascidians is sensitive to toxic insults especially from endocrine disruptors making them a suitable model to study neurodevelopmental defects. Modern techniques available for ascidians, including transgenic embryos where 3D time lapse imaging of GFPexpressing reporter constructs can be analyzed, now permit numerous end-points to be evaluated in order to test the specific mode of action of many compounds. This review summarizes the key evidence suggesting that ascidian embryos are a favorable embryological model to study neurodevelopmental toxicity of different compounds with molecular and cellular end-points. We predict that ascidians may become a significant source of marine blue biotechnologies in the 21st century. Keywords: Tunicates, Embryonic development, Neurodevelopmental toxicity, Blue biotechnologies, Screening, GRNs. 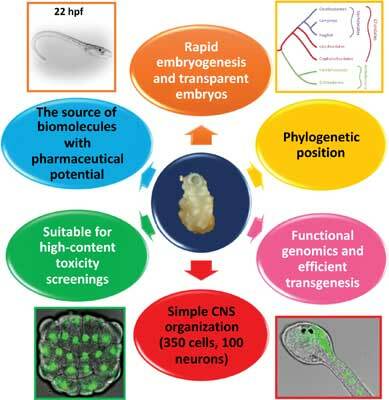 Keywords:Tunicates, Embryonic development, Neurodevelopmental toxicity, Blue biotechnologies, Screening, GRNs. Abstract:Ascidians (tunicates; sea squirts) are marine animals which provide a source of diverse, bioactive natural products, and a model for toxicity screenings. Compounds isolated from ascidians comprise an approved anti-tumor drug and many others are potent drug leads. Furthermore, the use of invertebrate embryos for toxicological screening tests or analysis offers the possibility to image a large number of samples for high throughput screens. Ascidians are members of a sister clade to the vertebrates and make a vertebrate-like tadpole larva composed of less than 3000 cells in 18 hours. The neural complex of the ascidian larva is made of only 350 cells (of which 100 are neurons) and functional genomic studies have now uncovered numerous GRNs underpinning neural specification and differentiation. Numerous studies showed that brain formation in ascidians is sensitive to toxic insults especially from endocrine disruptors making them a suitable model to study neurodevelopmental defects. Modern techniques available for ascidians, including transgenic embryos where 3D time lapse imaging of GFPexpressing reporter constructs can be analyzed, now permit numerous end-points to be evaluated in order to test the specific mode of action of many compounds. This review summarizes the key evidence suggesting that ascidian embryos are a favorable embryological model to study neurodevelopmental toxicity of different compounds with molecular and cellular end-points. We predict that ascidians may become a significant source of marine blue biotechnologies in the 21st century.